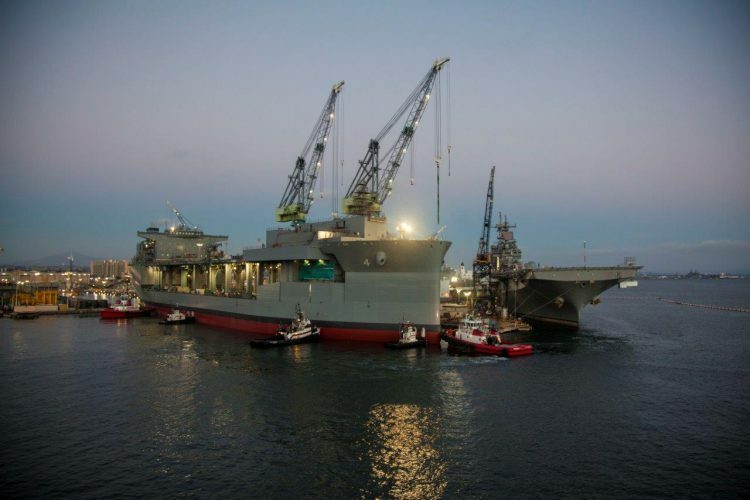 USNS Hershel ‘Woody’ Williams (T-ESB-4), successfully completed the first Integrated Trials for an Expeditionary Sea Base (ESB) ship January 19, sailing from and returning to General Dynamics National Steel and Shipbuilding Co. (NASSCO) shipyard in San Diego. Integrated Trials combine Builder’s and Acceptance Trials, allowing for the shipyard to demonstrate to the U.S. Navy’s Board of Inspection and Survey the operational capability and mission readiness of all the ship’s systems during a single underway period. During trials, the shipbuilder conducted comprehensive tests to demonstrate the performance of all of the ship’s major systems. «During the trials we were able to conduct a number of tests including full power propulsion, steering and anchoring», said Captain Scot Searles, strategic and theater sealift program manager, Program Executive Office (PEO), Ships. «ESBs are versatile platforms, and the ship handled extremely well demonstrating its readiness for delivery». USNS Hershel ‘Woody’ Williams (T-ESB-4) is the second platform of the ESB variant. ESBs have a maximum speed of 15 knots/17 mph/28 km/h and range of 9,500 nautical miles/10,932 miles/17,594 km. The ship can hold 100,000 gallons/378,541 liters of potable water and 350,000 gallons/1,324,894 liters of JP-5 jet fuel. Acting as an expeditionary sea base, ESB-4 is optimized to support a variety of maritime based missions including special operations force and airborne mine counter measures. The ESBs include a four-spot flight deck and hangar and are designed around four core capabilities: aviation facilities, berthing, equipment staging support, and command and control assets. The ship USNS Miguel Keith (T-ESB-5) is also under construction at NASSCO and plans to hold its ceremonial keel laying ceremony with a representative of the namesake’s family January 30. As one of the Defense Department’s largest acquisition organizations, Program Executive Office Ships (PEO Ships) is responsible for executing the development and procurement of all destroyers, amphibious ships, special mission and support ships, and boats and craft.